Data is central to everything we do in GDS. Our user researchers, analysts and data scientists experts work alongside product teams to generate insights that make digital services better. The Performance Platform has made big steps towards automating the collection and presentation of data from across government to improve Whitehall decision making. GDS has been writing in various places about our work with data for a long time. 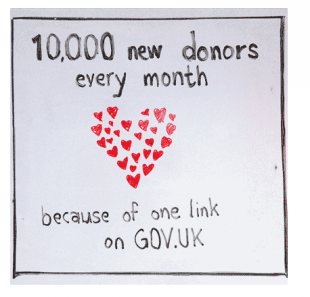 Just this month, we’ve blogged about GOV.UK’s 1st birthday numbers and launching the new Lasting Power of Attorney transaction on the Performance Platform. Now we’ve decided to give it a blog all of it’s own. Why? Data is only truly valuable when it’s applied and acted upon. It generally makes sense to talk about analysis in the context of the things it improves, rather than in the abstract. That’s why we have usually posted about data on the main GDS blog or on Inside GOV.UK, and we’ll continue to do that. But sometimes the process of analysing or producing new data throws up interesting questions that call for wider discussion - across government and outside of it. For a mainstream audience focused on a specific product, some of those questions may not be that interesting. For an analyst or datahead, they probably will be. We work with many different types of data in GDS and are trying to do a bunch of different things with it - automate collection of it, effectively present it, analyse large quantities of it, get service managers enthused about it. That’s a big challenge, but we know we’re not alone in attempting it. We want to get other analysts talking about our numbers and the choices we take with data - and hopefully, helping us to make more insights and better decisions. GDS faces some exciting challenges with our data over the next few months. How are we going to effectively present data to users in the Performance Platform? 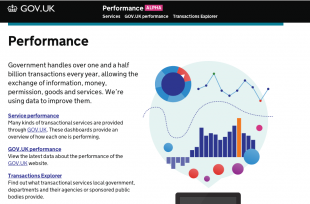 What can the Transactions Explorer tell us about government efficiency? How can we turn qualitative data from user research into crunchy actions that improve digital services? We’ll be aiming to write a post every week telling a new data story. Next week, we’ll look at what a deep analysis of the articles on GOV.UK reveals about the lifespan of government news.